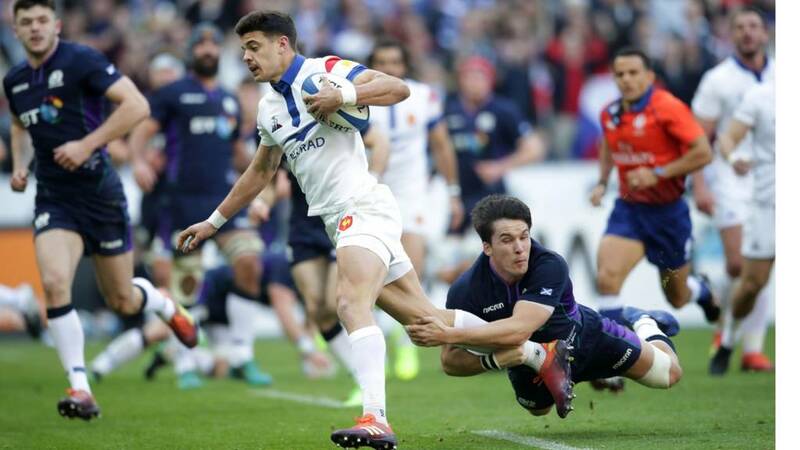 Well, if you're a Scotland fan, that was a rather deflating afternoon as Gregor Townsend's error-strewn and wasteful team were battered in Paris. Scotland host Wales in a couple of weeks' time then travel to Twickenham and will need to be immeasurably better to take anything from those Tests. France looked very, very good having been so very, very bad for most of the championship to date. They've got defending champions Ireland in Dublin next before finishing their Six Nations against Italy. Plenty more rugby to savour this weekend, though, starting with a massive clash in Cardiff between Wales and England. Follow the action here and enjoy the rest of your Saturday. Quote Message: Scotland didn't put any real sustained pressure on France. They made nine line-breaks today and they scored one try off that. That sort of stat - you're not going to win international games. Great that you're making line-breaks, but so what if it doesn't lead to anything? Scotland didn't put any real sustained pressure on France. They made nine line-breaks today and they scored one try off that. That sort of stat - you're not going to win international games. Great that you're making line-breaks, but so what if it doesn't lead to anything? 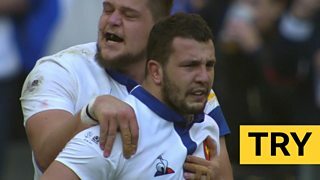 Here's the late, late try that earned France their bonus point. Quote Message: We are our own worst enemy. We give poor passes. The eight times France crossed over the line, how many times was that down to errors from Scotland? France played well but they're not a good side and that's what hurts because it's one of the weakest French teams. We are our own worst enemy. We give poor passes. The eight times France crossed over the line, how many times was that down to errors from Scotland? France played well but they're not a good side and that's what hurts because it's one of the weakest French teams. France's 17-point victory is their biggest in the Six Nations against anyone other than Italy since they won 28-9 against Wales eight years ago. Here's the Ali Price try that gave Scotland fleeting hope of salvaging a losing bonus point. Instead, it was France who stretched their lead and took another point at the death. Quote Message: France went back to old-time France and turned on the power. Their pack was tremendous all day and they blasted Scotland. They won a resounding victory. Scotland, when you're not taking your chances, you're not going to win Test matches. France went back to old-time France and turned on the power. Their pack was tremendous all day and they blasted Scotland. They won a resounding victory. Scotland, when you're not taking your chances, you're not going to win Test matches. Scotland flanker Magnus Bradbury on BBC Radio Scotland: "It's frustrating to be involved in. I'm sure you saw how many chances we created for ourselves but we just couldn't make those final passes stick. "That's something we're going to have to look at next week and moving forward and get better at." Here's the first of Gregory Alldritt's second-half double, the latter of which came a good eight minutes after the clock went red. Quote Message: The starting XV - Jamie Ritchie and Grant Gilchrist for me were the two that you would say got plus points. The rest - disappointing. Too many errors. Poor passes. Poor skill-sets. We know it's a cauldron. I've been there, I've played there. It's a cauldron to play international rugby in, but you're an international rugby player and some of those performances, for me, weren't of international calibre. The starting XV - Jamie Ritchie and Grant Gilchrist for me were the two that you would say got plus points. The rest - disappointing. Too many errors. Poor passes. Poor skill-sets. We know it's a cauldron. I've been there, I've played there. It's a cauldron to play international rugby in, but you're an international rugby player and some of those performances, for me, weren't of international calibre. Quote Message: The French spirit is back, quality at the set-piece, quality in the backs and the youngsters responded. The French spirit is back, quality at the set-piece, quality in the backs and the youngsters responded. Quote Message: Not good enough from Scotland, they were not clinical enough, they had their chances but did not take them - very disappointing. Not good enough from Scotland, they were not clinical enough, they had their chances but did not take them - very disappointing. So, a day that began with such hope for Scotland ends in frustration and despair. They were bullied and bludgeoned by a resurgent French team that showed class in abundance and no little ruthlessness. They've answered a few critics after their insipid start to the championship. Romain Ntamack, Yoann Huget and a Gregor Alldritt double earned France a four-try bonus point. Scotland, error-strewn and wasteful, leave Paris with nothing. They have now lost 11 matches in the French capital since their last win 20 years ago. Quote Message: France have controlled possession and territory, played with real accuracy and looked a complete side. Scotland did not challenge at the set-pieces like they would have liked. France have controlled possession and territory, played with real accuracy and looked a complete side. Scotland did not challenge at the set-pieces like they would have liked. Quote Message: From a Scotland point of view it's been a horrific game. It's been poor. The bench came on and actually played pretty well. But you need to give yourself a foothold in the game before that happens and Scotland have not done that. Too many errors. From a Scotland point of view it's been a horrific game. It's been poor. The bench came on and actually played pretty well. But you need to give yourself a foothold in the game before that happens and Scotland have not done that. Too many errors. Scotland are a complete shambles. This team has gone backwards with Townsend. Soft touch. Scotland are truly shocking. Everytime we get into a promising position we lose the ball. Amateurish. What a gutsy response this has been from France, under so much pressure coming into this game. They've kept going, kept bullying Scotland and punished them dearly. They had numerous opportunities to end the game with the clock red, but kept grafting to the 88th minute, when they land their bonus-point score. Gregory Alldritt gets his second of the afternoon. Anthony Belleau slots the conversion and brings to an end a breathless match. Quote Message: The French pack taking control, like they did in the 2000s when they would take control late on in games. They have really controlled this game with their ball carrying and at the line-out - they have played very, very well. The French pack taking control, like they did in the 2000s when they would take control late on in games. They have really controlled this game with their ball carrying and at the line-out - they have played very, very well.